House shares: the in-between renting option for those who need to get out of their parents’ hair but can’t quite stretch to their own place. I was a snob to house shares after uni, promising myself I’d never have to live with strangers again now I was out in the real world with a real full time job. How innocent I was! The fact remains that despite having a paid full-time job straight out of uni, life is pretty bloody expensive and at 22 years old, just a year after graduating, I was never going to be able to afford my own place. I got myself a new job in London and needed to move out of my Dad’s place in Hampshire, so I knew a house share was my best bet. To state the obvious, London is really expensive. I looked at eight rooms before lumping for one in East Surrey, but most I viewed were in south London and were priced at around £800 for a damp, old box room – absolute robbery. Although I live further out from the city, I pay £525 a month for a double room, bills included, with a garden and brand new furnishings. 1. What do you want. I knew I wanted to be near a train station, in a house with at least one other female and preferably in a modern building. I realised how important the latter was to me after viewing some absolute horror old houses that hadn’t been looked after and were smelly, mouldy and generally unpleasant. 2. Do your research. I knew next to nothing about south London when I began my hunt, with my knowledge extending to Clapham being ‘quite cool but expensive’. It makes me smile thinking about it now, but I really didn’t have a clue what I was doing! I knew I wanted to live south of the river because my new job was based near London Bridge and I knew people around the south London/East Surrey area. I then looked at what areas I could afford, which places were nice near the train stations and what deposits were being asked for. Some want two months rent upfront plus a deposit AND admin fees – that’s completely unreasonable and I couldn’t afford it anyway. 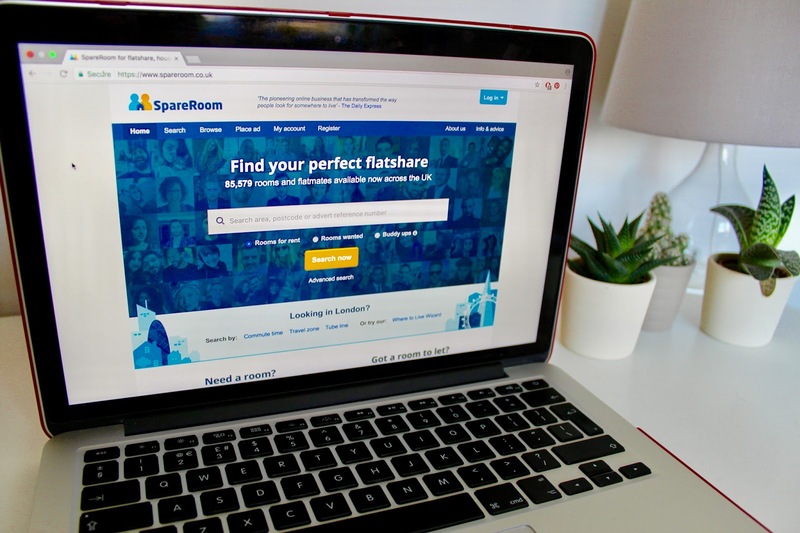 I used SpareRoom.com to hunt for house shares, but other options include Gumtree and RightMove. I think SpareRoom and RightMove are the safest ways to meet with landlords, as they need to be a registered landlord before advertising (Gumtree just seems a bit shady to me). 3. Meet your housemates. This is absolutely essential. In one of the places I viewed, the live-in landlord showed me around and he was an absolute creep. Three other females lived there and he said he insisted on doing their washing because he was a good landlord, and then winked at me. He was about 5ft tall and probably weighed the same as an infant so I knew I could take him on, but that’s not really the good start you want! I actually only met one of my housemates before agreeing to move in, and he seemed okay at the time. He ended up being a bit of a weirdo, but it was the eighth house I’d looked at, I was going to be homeless in three weeks and everything was brand new in the room I was to be renting, so I just went with it. If I did it all again, I would insist on meeting everyone before signing on the dotted line. 4. Know that it’s not easy. It’s been almost two years since I moved into my house share and lots of people have come and gone in that time, meaning I’m the longest standing tenant. 5. Be assertive. When you’re reading through your contract, flag up anything of concern to your landlord. We don’t have locks on our doors because of something to do with insurance, and I wasn’t even allowed to have one fitted after that guy came into my room. If something like that is important to you, before you sign the contract is the time to bring it up. There may be some things you aren’t willing to compromise on, but you have no grounds for argument with your landlord once that contract is signed. Similar to this is how precious you are about your possessions. If you are funny about people using your things (plates, iron, milk), make that clear early on. It’s hard to break people’s habits once they’ve got used to how things are, but if you make it clear from the start what you’re willing to share and what you’re not, it’ll make life much easier in the long run. 6. Check the contract. Aside from what I mentioned above, looking at your get-out clauses is really important. Despite great first impressions, you may not enjoy living in your house after giving it a good go and it’s reassuring to have a clause that enables you to get out before a whole year’s tenancy. Most house shares offer a six-month break clause in the first year, meaning you can move out after six months and still get your full deposit back. 7. Remember it’s not forever. Few people envisage their living situation in their twenties or thirties to be in a house share. Like I mentioned at the start, look at it as an in-between arrangement while you get on your feet or arrange other plans. I’m planning on moving in with my boyfriend when my tenancy runs out in the summer, and if anything every annoys me now I think to myself just a few more months to go! You need the patience of a saint to never get annoyed living in a house share, because the bottom line of it is that you’re a group of people who don’t know each other living under one roof – it’s highly unlikely you’re not going to annoy each other at some point. But you might also make lifelong friends who you’ll stay in touch with in years to come – and you might even move in with a good cook! What we did, I do research for the house location I want. Then there's a lot of results which gives you headache. 🙂 But luckily we found the house we need, a house and lot in Pampanga that gives us comfort!